It was cold last night, about 5ºC. We get up about 8 am and have a leisurely start. Ron's brother Eric is supposed to meet us here at 9 am. We have breakfast and pack up but he still has not arrived. We head off at 9:55 am and turn right. We cross the Forbes River, a lot less water than last time and come to the second crossing. Almost as soon as we stop, Eric arrives. He must have driven into the camping area a few seconds after we left. We cross the river again. It is a lot shallower than last time when we could not cross. After introductions, we head off and turn right at Coachwood Road. Four kilometres along this road we turn left along a track. 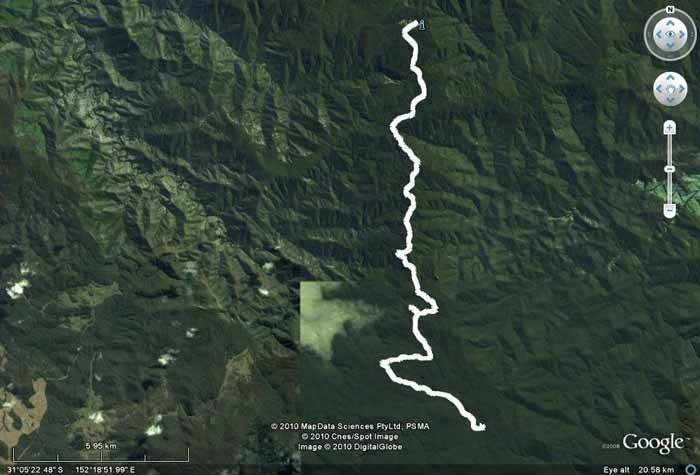 This leads less than a kilometre to Hoppys Lookout (GPS S31° 06' 46.2" E152° 20' 18.0" using WGS84 as datum). 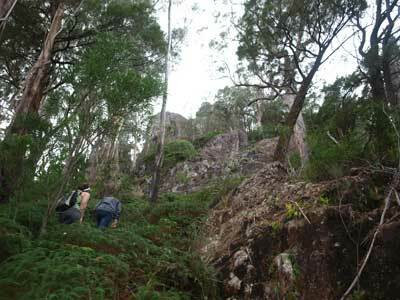 We reach Hoppys Lookout at 10:30 am. This has fantastic views out to the south, west and north over the extremely rugged valleys. There are some very interesting boulders here and we can see a waterfall across the valley. After taking some photographs and seeing Kemps Pinnacle which we are climbing next, we have morning tea here. It is quite cool, between 16ºC and 20ºC depending on the shade of the road. 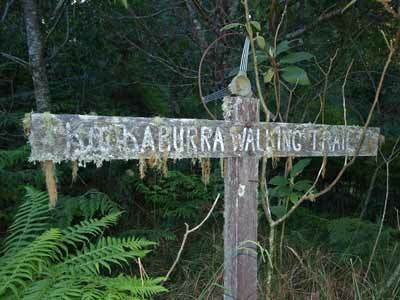 We continue down the road and it is less than a kilometre to the start of the walk to Kemps Pinnacle. This is not sign-posted and there is no parking area. The location is GPS S31° 06' 27.4" E152° 20' 27.1" (using WGS84 as datum). The start of the track can be hard to find and it is a very rough and sometimes indistinct path pushed though the ferns and bushes. In some places, there is pink/orange tape making the track, but you will need to be careful. I would recommend taking a GPS and leaving it on to mark your track so you can easily find your way back in case you get lost or on the return. We start the walk at 11:25 am. Eric's young son Drew leads the way. He has done it a number of times, the most recent one just before Christmas. 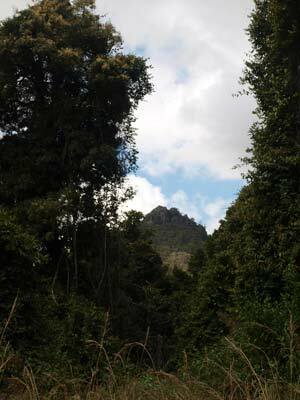 The track goes up over the ridge to the north of the road and then goes down a bit before climbing back towards the base of Kemps Pinnacle. This is a twin peaked rock, which cannot be clearly seen till you get close. Once at the base, the vegetation ends and you wind your way up till you get to a spot jest below the lower of the two peaks. It takes about 45 minutes to get to here. This is where it gets much harder. You have to use a rope to pull yourself up a crack, using your feet to get leverage to move a little higher. Kelly has problems and has exhausted herself and can not go on. She and Tegan start back to the car while the rest of us climb the short distance to the lower peak. The view from the top of this lower peak is spectacular. You can see almost 360º, only the bit behind the higher peak is blocked. The higher peak is a shear walled rock, with no apparent way up. I say apparent, as people have climbed it as there is a rock cairn on the top. Perhaps they brought proper rock climbing gear. After taking some photos, Ron finds a tin that has many notes in it. I add our names and date to one of the notes and then find a $5 note. It has "use it well" written on it. I give it to Drew. It is much easier getting down off the rock and it takes about 45 minutes to get back compared to the one hour to get to the top. We depart at 1:45 pm and head further along Coachwood Road. We arrive at Kookaburra at 2:10 pm. It is still high here, almost exactly 1,000 metres above sea level. We have lunch, really needed after the walk. Kookaburra was established in 1946 by foresters who were logging the area for red cedar, rosewood and coachwood. A timber mill was built (more about this later) and about 30 men were employed in logging and the mill. The mill closed in 1967. Now there is not much left of the town. There is a small building that was the school. This has a sign "Kookaburra Public School 1968" on it. I am not sure about why it would have been built a year after the mill closed. It is very small, only one room. 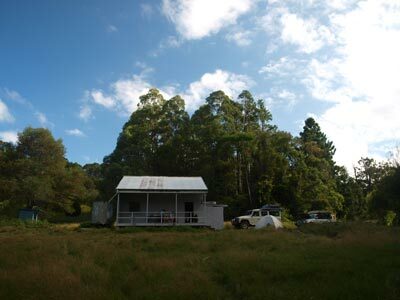 The school is now leased to the local Scouts and used by them as a base for activities like bushwalking and camping. Adjacent to this there is another small building. This was the forestry office and apparently at one time used by National Parks and Wildlife Service (this is marked on topographical maps) but I do not recall this. There is space here and nearby to camp. After lunch, we head off on a walk to see the remains of the mill and then a walk to a waterfall. 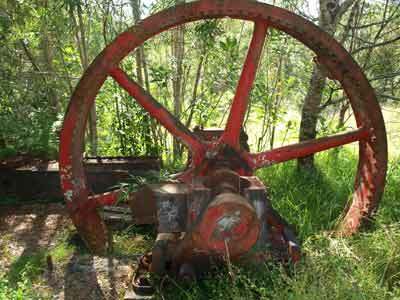 There is a huge fly-wheel on the other side of the road and a short distance into the bush. There are the remains of old roads and some other structures. From here we walk to Carrai Road and a short distance along we see an old and ornate state forests' sign showing a walk to the top of a waterfall. 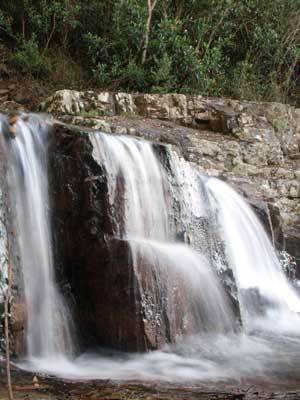 This waterfall is called Stockyard Creek or Kookaburra Waterfall. It is about one kilometre each way from the school. It is a flat walk. There are lots of signs identifying trees along the way. It is a pity that the sign to the falls is almost hidden as most people will drive straight past without knowing it is there. At the top of the falls there are excellent views over the valley. We return to the school. I run the car's engine for a bit to put some power back into the second battery. As we have not gone far today, there has not been much change to recharge after the battery problems of yesterday. Eric is the caretaker of the school and has the key. We have a fire going in the fuel heater as well as an outside fire. The heater also heats water in an old hot water system so we can have a hot shower. Most of us are cooking baked dinners so we need lots of good coals. The fire is going early and we have lots of timber to burn. After a very long and hot shower, we start preparation for dinner. Kelly and Donna are having a cook off of garlic prawns and Ron and Tegan make dampers to go with the prawns. Donna is doing her normal garlic prawns in her small camp oven while Kelly is doing a creamy garlic sauce in our wok over the fire. We have also put on our roast beef. Once Ron announces that the damper is almost ready, Donna and Kelly cook their prawns. We share the prawns around, with everyone who likes them having more than enough. The result? A great success by both ladies, worthy of Masterchef (an idea, what about a TV show for cooking out in the bush?). We soon put our vegetables on and an hour after starting, it is all done. We move inside the school and have a brilliant roast beef dinner with potatoes, pumpkin and carrot. Washed down with a wine, it is as good as any meal from a $100 restaurant. We retire back outside around the fire and watch the stars. They are very bright up this high. Eric, Ron, Drew and Tegan take runs playing the guitar and singing. We have a few sing-alongs to better known songs. I hate musically talented people! Kelly and I go to bed at 9:45 pm and have a very sound sleep again. It is warmer than last night, perhaps 7ºC just before dawn.